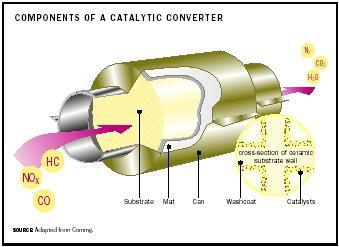 The catalytic converter in an automobile is an expanded section of exhaust pipe occurring upstream of the muffler in which pollutants generated in the engine are converted to normal atmospheric gases. It is an essential element in the emissions control system of modern automobiles. This technology was introduced in the United States in the late 1970s and became legally required by the early 1980s because of more stringent exhaust emission control standards. Early catalyst systems, as applied to vehicles with carburetors, attempted to oxidize carbon monoxide (CO) and unburned hydrocarbons (HC) to carbon dioxide (CO 2 ) and water vapor, using air added by means of an air pump or rapidly actuating valve system. Although constructed from a high-surface-area alumina substrate with a noble metal (usually platinum) on the surface, their effectiveness was limited by extreme conditions of service. These problems include high temperatures (greater than 1,000°C) exacerbated by a large and variable "engine-out" pollutant load and constant vibration from roadway and engine sources. rhodium metal in conjunction with the platinum now allow for both good longevity and "three-way" operation. Not only are the small amounts of residual CO and HC oxidized, but the nitric oxide pollution emissions are simultaneously reduced to nitrogen (and some nitrous oxide, a potent atmospheric greenhouse gas, but otherwise nonpoisonous). The tetraethyl lead present in gasoline as an octane booster in the 1970s was removed not because of its effects on human health, but because it rapidly poisoned catalysts. Its removal, although coincidental, has had enormous benefits for human and environmental health. Current pressure to reduce the sulfur content of fuel arises, in part, from evidence that sulfur has a similar, but much smaller effect on catalyst longevity and effectiveness. SEE ALSO G REENHOUSE G ASES ; L EAD ; O ZONE ; V EHICULAR P OLLUTION . Kovark, William, and Hermes, Matthew E. "The Role of the Catalytic Converter in Smog Reduction." Available from http://chemcases.com/converter .